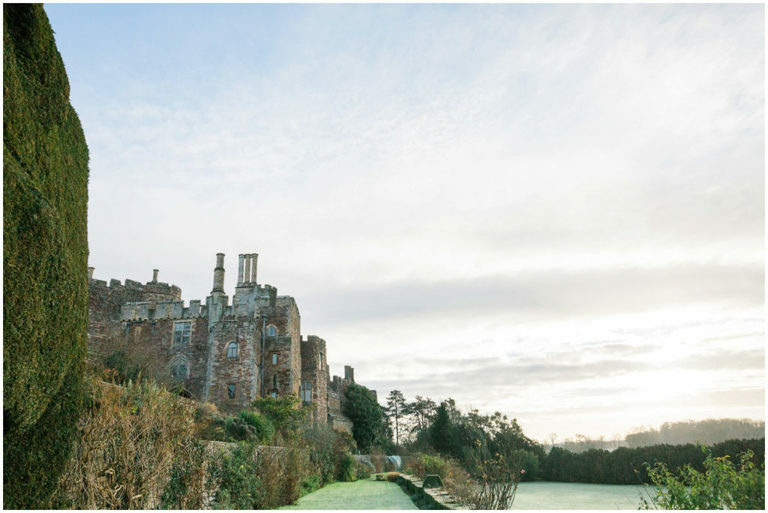 I photographed Joe & Emma’s beautiful winter wedding at Berkeley Castle, Gloucestershire. It was such a stunning wedding a few days before Christmas. Emma and Joe married in the church on the grounds of Berkeley Castle. They then had their wedding reception in the grand great hall within the castle. I couldn’t believe how gorgeous the Castle looked especially their huge Christmas tree. Tell us the story of how you first met. What happened and when? We met through a mutual friend (Graham – our Best Man) and everything went from there! First date? Any stand out moments? Our first date was at Prezzo. I was only 17 and had never had a ‘proper’ date before so found it a little awkward being sat just the two of us between a romantic candle! But it obviously went well and it was where our mutual love of food (and Honeycomb Smash Cheesecake) began! What’s your best memory or funniest story of your time dating? We only dated for a month or so before we ‘officially’ got together but we did many of the usual dates, such as meals out and cinema trips! swanky looking hotel in Trafalgar, Joe was waiting on a deserted rooftop in the Vista Bar ready to propose. It was the most amazing moment, and we were overlooking the London Eye! We had champagne and chocolate coated strawberries! We then enjoyed the rest of our trip by going ice skating at Somerset House and an overnight stay in one of our favourite hotels in London, the Park Plaza Westminster Bridge. The following day we had a trip up The Shard. To announce our engagement, Joe and Meryl had prepared a wonderful video which included a sign telling the story of our relationship around various memorable spots around Gloucestershire (https://www.youtube.com/watch?v=-xGDyq7fUnw see Video here!) The ring was a family heirloom, belonging to my Nanny, that Joe had refurbished and re-stoned to include a beautiful ruby. Its beautiful and so special to me. Designer and the boutique of your dress? My dress was from Grand Jour. My dress was a real princess dress, very fitting for our venue. It was very sparkly, with a light gold layer underneath the ivory skirt. It had little capped sleeves to suit out winter wedding. How did your dress make you feel when you first put it on? It was the one! Both mum and I were crying when we saw it together so we knew it was the right one for me. The style fitted perfectly and went in at the waist to suited my figure. It was perfect! How did you accessorize? Tiara, jewellery, veil, shoes and where you brought them from? I brought my floor length sparkly veil and hair piece both from Grand Jour. I didn’t accessorise much as the dress spoke for itself. My shoes were a bargain from www.jdwilliams.co.uk . The groom! What did he wear and where did he get it from? How did you feel when you first saw him at the end of the altar? I was a little nervous before going in to the church, but when I saw Joe all the nerves disappeared! I believe he said the same. I thought he looked amazing and the shoes we found only a few days before (!) were perfect from a small shop in Cirencester. Tell us about your bridesmaids, flower girls and pageboys. Who are they and what are your relationships with them? I had 3 bridesmaids and a maid of honour. Meryl was my maid of honour and we have been best friends since Primary school. Isobel was a bridesmaid who is Joe’s younger sister and two of my other close friends, Charlotte and Shauna, were the other bridesmaids. What did your they all wear? Please tell us about the designer, boutique, shop, accessories, material and style of their dresses? After the girls tried on a variety dresses in various shops and getting frustrated with prices, I found my perfect dresses online for only about a quarter of the price! We bought the dresses from www.belleboutique.co.uk and were a perfect match in colour, style and the correct amount of sparkle! 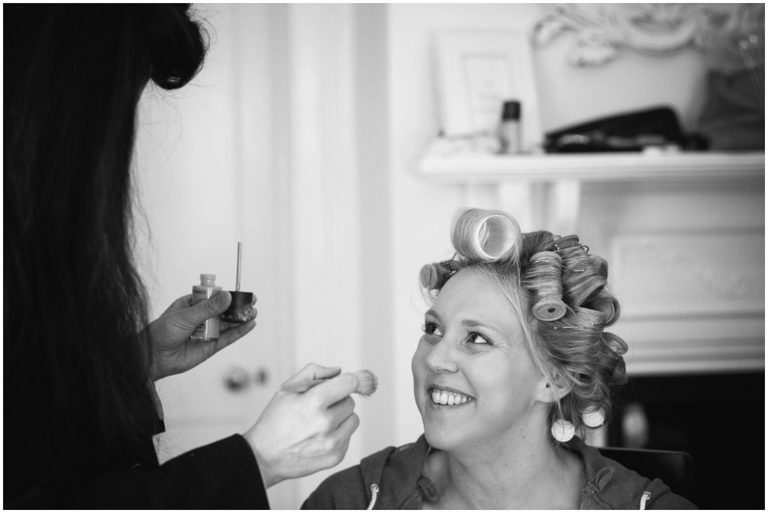 Make up and hair – did you do your own or hire professionals? 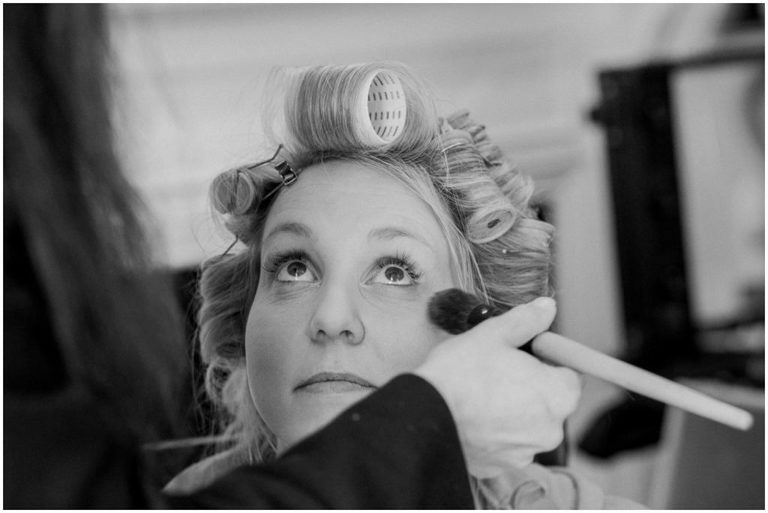 Tell us about the products/brands you used, how you felt and if you have any tips for brides-to-be. We chose to have both our hair and make up done by professionals and I wouldn’t recommend that enough! It was such a wonderful morning and we all enjoyed being pampered. The make up was my treat to everyone and my Mum treated us all to our hair. We hired Maddy from WeddingPaint who was amazing! Our hairdresser, Belle, from The Burdes Nest in Gloucester Docks came with 2 of her team members. They were fantastic too and we all had such a wonderful few hours laughing and enjoying ourselves. What readings did you have and who delivered them? We had both our brothers doing the readings at our ceremony. Harry (Joe’s brother) read our first reading, Song of Solomon and Mike (my brother) read ‘Love is a Temporary Madness’ from Captain Correli’s Mandolin. It was a wonderful service and they both read very well. What music did you have during the ceremony? Our music and hymns were very traditional as we wanted a traditional wedding. I walked down the aisle to Wagner’s Bridal March and we left the church to Mendelssohn’s Wedding March. We had 4 hymns in our service, including 2 carols! Isobel (Joe’s sister) sung the first verse to Once in Royal David’s City which was so amazing and very emotional for us all. Who walked you down the aisle? What’s your best memory of the ceremony? I loved every second of the ceremony, it was definitely the best part of the day! I loved how it was so personal to us, with our siblings each taking part. Richard made our service so funny and happy and we just loved it all. What did you serve as a wedding breakfast? Tell us about the menu… We have had so many compliments on our wedding breakfast and we are so glad! It is mine and Joe’s perfect meal. We had a starter of deep fried brie with a cranberry compote, main was a Fillet and Featherblade of beef / Mushroom and goats cheese wellington followed by our ‘Crackling Trio’. Joe and I are very proud of our concocted dessert – a vanilla Crème Brûlé, a chocolate brownie with popping candy and salted caramel icecream! Heaven! Who gave speeches and what did they say? My Dad, Joe and Graham (Best Man). They all did brilliantly and all came across really well. Graham was especially funny and we have them all on tape so it has been lovely to re watch them and enjoy them over and over. We didn’t have an obvious theme, but took advantage of the time of year and went down the wintery (rather than Christmas) route. We also had snippets of us throughout the day – I had a rose in a glass dome for my love of Beauty and the Beast and the guests entered the Great Hall for the Wedding Breakfast to Hedwig’s Theme from Harry Potter. Our Save the Dates were from vistaprint.co.uk and were grey with snowflakes on. We made our own invitations with shimmery paper and burgundy ribbons. Our thank you cards were ordered from Optimalprint.co.uk and included some of our favourite photos from the day. We sorted most of the decorations ourselves. Our tables were mainly silver, with sequinned table runners from Amazon and lots of little glass tea light holders from IKEA. We chose to have large candelabras with a floral arrangement (from Berkeley Flowers) in the centre of each table which were amazing! I made my own table plan with bits and bobs from Hobbycraft and the frame was also an IKEA bargain! Tell us about your flowers and who provided them? The flowers were perfect! They were mainly white and silver with some highlighted red sparkly berries and roses – a perfect winter bouquet! I carried a waterfall bouquet and the bridesmaids had smaller handheld ones. The buttonholes were white roses with red berries and gypsophila. Joes was extra special with an added diamanté into the rose! Our centrepiece flowers matched the bouqets and the top table had a ‘long and low’ arrangement. What type of cake did you have? We had a 3 tier sparkly, snowflake wedding cake which was absolutely beautiful. It was topped with a white/sparkly gingerbread man and lady! It was made by our very talented family friend, Marina Smith. We went for 3 layers: chocolate, raspberry and white chocolate and lemon sponge. We were also treated to a more traditional fruit cake topped with 3D ambulance and chalkboard to represent our jobs! It was amazing and such a lovely surprise! What favours did you guests receive? Our guests all received a cupcake on their plate! These was made by a local company called Meadow Cakes in Cirencester – they were amazing! We chose red velvet cupcakes with a white/sparkly icing topped with snowflakes. They looked and tasted so good. How did you entertain your guests and how did they respond to it? During our drinks reception we hired Angharad James, a Gloucestershire based harpist, to entertain our guests. She was very good and played lots of our favourite pieces, including music from Wicked and Harry Potter! We went for a DJ in the evening from Oxygen Discos. What was your first dance song and why did you choose it? Our first dance was lovely – we had dry ice to make it extra special! Our song was ‘As Long As Your Mine’ from our favourite musical Wicked. Where did you go, who did you book with, what did you do and how long did you stay? We booked our honeymoon to Las Vegas with Virgin Holidays and we went for a week the following day after our wedding. We had an amazing time and stayed in The Wynn, perhaps one of the best hotels weve stayed in. We had floor to ceiling windows overlooking the Strip. We were lucky enough to take a trip to the Grand Canyon where we took a helicopter ride into the West Rim of the Canyon and toasted our honeymoon with a glass of champagne! We also enjoyed a Las Vegas show, Le Reve, and enjoyed lots of American food! What are your three most memorable moments from the day? It is so hard to choose as our whole day was absolutely amazing. I did love the church ceremony, I enjoyed the speeches / wedding breakfast and we really enjoyed our sparkler send off at the end of the night! What are your top tips for brides-to-be? Anything you would do differently? Our biggest thing was we just needed to keep reminding ourselves that this was our day and to try not let other people worry you! Whilst we obviously wanted everyone to enjoy themselves, we chose certain things because that was what we wanted! No, our day was perfect! And those moments where things don’t quite go to plan are what makes the day even more memorable!